A free tow service roves Highway 17 between Scotts Valley and the summit during peak traffic hours looking to help anyone that is stranded on the highway. For additional information visit the Motorist Assistance web page. The Safe on 17 Task Force was developed in 1999 and still continues today to implement strategies to improve safety on Highway 17. For more information, visit the Safe on 17 information page and meeting page. Measure D is a ½-cent, 30-year sales tax measure passed in November 2016 by over 2/3 of Santa Cruz County voters. The Highway 17 wildlife crossing is a partnership between Caltrans, the Land Trust of Santa Cruz County and the Santa Cruz County Regional Transportation Commission. 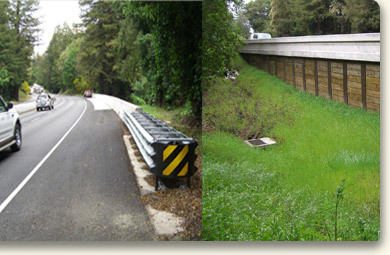 Caltrans will be constructing a wildlife tunnel under Highway 17 near Laurel Curve to allow safe passage for wildlife. The wildlife corridor connects two core habitat areas that the Land Trust has protected from development. Measure D will provide $5 million for construction of this project. For additional information see the project fact sheet. Caltrans presented information about the project at a Public Information meeting in Scotts Valley on May 2, 2018 and to the RTC board on May 3, 2018. View the Caltrans presentation. The Highway 17 guardrail project to upgrade guardrails at twenty-eight different locations between Scotts Valley and the Summit in Santa Cruz County (PM 6.1-12.5) was under construction in 2011. Guardrail improvements include upgrading end treatments to current standards, replace/reconstruct metal beam guardrail, and replace some metal beam guardrail with concrete rail or K-rail. Guardrails can prevent vehicles from veering off the roadway or into oncoming traffic, or crashing against solid objects. Approximately 20% of the project was completed when the contractor went bankrupt. The remaining part of this project will be re-advertised in 2013. In 2012, the Vine Hill Road Drainage Project (Figure 1) was completed. This project included super-elevation correction, minor widening, and a new guardrail on Highway 17 near its intersection with Vine Hill Road (PM 7.14/7.25). The Santa’s Village Road New Guardrail Project to provide a wider southbound (outside) shoulder and construct a concrete guardrail in an area where no guardrail previously existed has been completed (PM 6.1/6.5 SB). In March 2012, Caltrans installed a median barrier along Hwy 17 separating northbound and southbound traffic at the Laurel Rd intersection, a head on curve warning sign in the northbound direction north of the Laurel Rd intersection, and a radar speed feedback sign facing the southbound direction approaching Laurel Rd (Figure 2). A high friction surface treatment was installed on Laurel Curve in the southbound direction in July 2012 to test this treatment for its ability to reduce speed-related collisions. A project to install a retaining wall and widen the shoulder in the NB direction north of Laurel Road will begin construction in summer 2014. 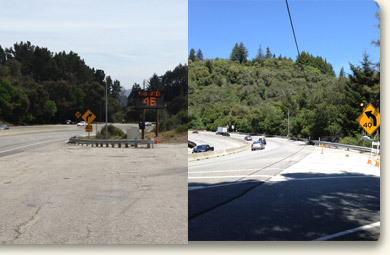 A project to construct a retaining wall with concrete slab and barrier along Hwy 17 near Scotts Valley (0.2 miles north of Glenwood Dr.) will begin construction in spring 2013. Caltrans District 4 and 5 is working with Santa Cruz County, Santa Clara County, California Highway Patrol and the Santa Cruz County Regional Transportation Commission to develop a plan to address access along the entire length of Highway 17. Public Outreach is a key component of the plan. This long term plan is needed to compete for funding to address access issues along this corridor. The goal of the wet weather project is to reduce wet weather related collisions. In 2012, construction on the drainage systems upgrades, median barrier installation and pavement resurfacing along Highway 17 just north of the summit in Santa Clara County was 95% complete (PM 0.0/2.8, Figure 3). The remaining 5% of the project is to line the culverts that are under the roadway for water quality purposes and will be completed in spring of 2013.